ANOTHER VIDEO DESCRIBING THE ATTACK AND THEY CALL IT - A PIT BULL!!! MOBILE, Ala. (WPMI) An investigation is underway after a six-year-old boy was mauled by a dog in Wilmer. He's in Birmingham right now undergoing emergency surgery. 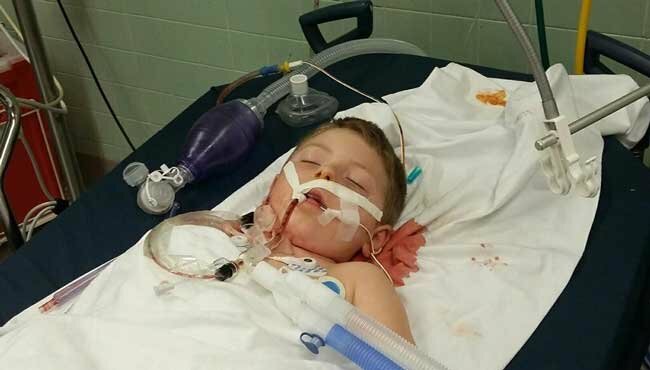 The boy's father witnessed the horrifying attack that happened while his son was playing in the front yard at a friend's house. 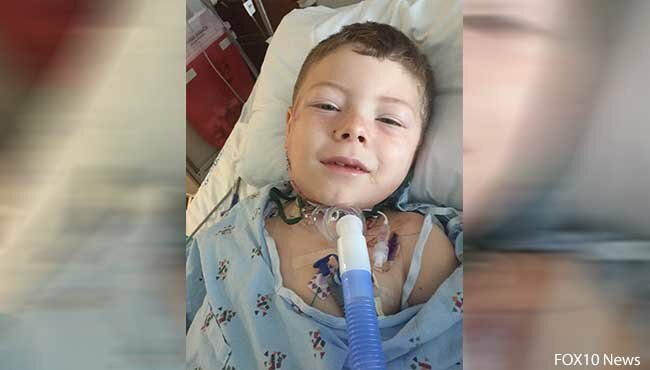 6-year-old Andrew Bulger has had three surgeries since the attack happened Monday night at a home on Mars Court in Wilmer. Doctors expect that more surgeries will be necessary. "The dog broke the swivel and got my kid. He lunged at him the first time to bite him in the face. It knocked him down. The second one he got down there picked him up in the air and shook him," said Andrew's father Michael Bulger. Now Mobile County Animal Control officers have the dog in their custody for quarantine. Meanwhile, Andrew's parents are staying by their sons side at UAB hospital in Birmingham and asking the community for prayers. 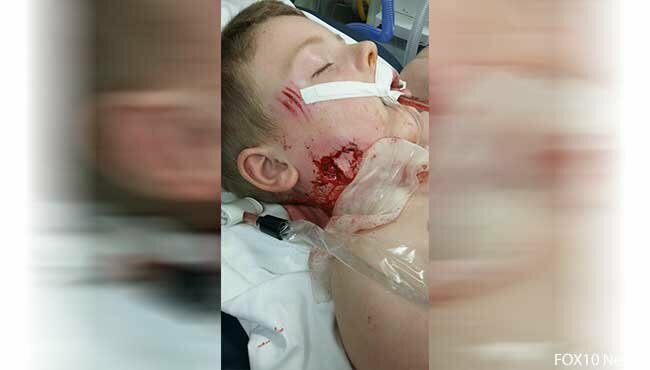 "There's a laceration on his throat like somebody took a knife and cut his throat. That's where the teeth cut through the cartilage in his larynx. That's the worst damage done is to his throat," said Bulger, who now wants to see the dog put down. "It's not a problem with bulldogs. It is a problem with the owner not spending enough time with the dog, the owners keeping them on a chain. I'm not sure what the issue is but there should be something brought to light about this so you don't have dogs that act violently toward people," said Bulger. 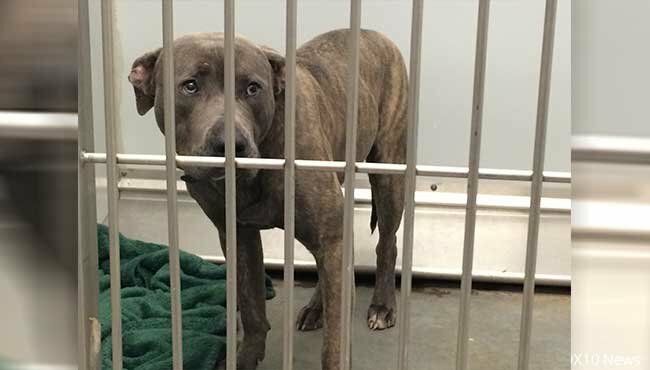 Officials said the dog is a MIX BETWEEN A PIT BULL AND AN AMERICAN BULLDOG. Animal Control along with the Sheriff's Office are investigating. Their findings will be handed over to the District Attorney's Office. A gofundme has been set up to provide relief for Andrew Bulger. At least he is able to smile now... a little bit anyway. "It's not a problem with bulldogs. It is a problem with the owner not spending enough time with the dog, the owners keeping them on a chain." Sorry dude, it doesn't matter how well you treat bulldog types---they were bred for baiting and killing. They're high risk pets, period. It's unreal. These maulings happen far too often.